At its most basic, a slideshow is simply a compilation of images set to play in sequence one after the other. However, most slideshows rely on other elements to make them stand out – such as background music, voiceover narrations, animated transitions, or even text and video elements. That is why if you want to create a slideshow, you should try using Movavi Slideshow Maker for Mac. Not only will it provide you with an easy way to compile your slideshow, but it will also furnish you with features that let you add various other types of elements to make your slideshow look unique and stand out. It is really very easy to learn how to make a slideshow on Mac using Movavi Slideshow Maker for Mac, and to start you just need to launch the software and select the mode that you want to use. There will be two options that you can choose from: The ‘Easy mode’ or the ‘Full feature mode’. To put it simply, Movavi Slideshow Maker for Mac’s ‘Easy mode’ is a straightforward 3-step wizard that will help you to quickly create a slideshow. As soon as you select the mode the interface will appear with 3 tabs (one for each step). In the first step, you can add photos to Movavi Slideshow Maker for Mac, either individually or by folder. Once added you can arrange the sequence in which they are to appear, adjust the slide duration, and enable or disable an automatic pan and zoom effect. Next, you will be able to choose the transitions that you want to appear between slides, by selecting one of the many styles (or opting not to include transitions). To ensure the transitions don’t affect the pace of the slideshow, Movavi Slideshow Maker for Mac will let you adjust the transition duration. Finally, the last step will let you add background music by choosing your own audio file or using one of the tracks included in Movavi Slideshow Maker for Mac. If you want you can set the slide duration to automatically match the music tempo. That is all that it takes to create a slideshow in Movavi Slideshow Maker for Mac’s ‘Easy mode’, and as you can see it is a straightforward and simple process. If you want a quick or easy way to create a slideshow, it is definitely worth looking into. If you select the ‘Full feature mode’ on the other hand, Movavi Slideshow Maker for Mac will provide you with a ‘Timeline’ interface where you can add photos and even videos to form your slideshow. It has numerous additional features as well that you can use to improve your slideshow. 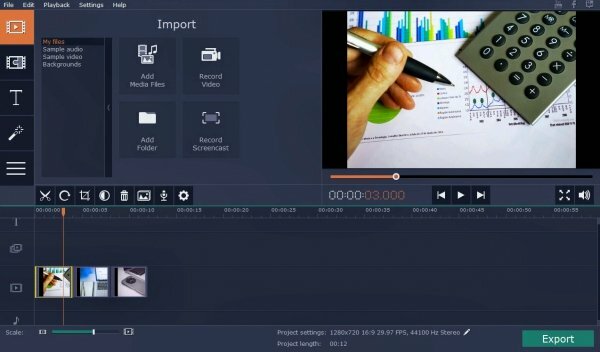 Some of the unique features that you’ll find in the ‘Full feature mode’ include filters and special effects, customizable text fields, audio editing tools, and image and video quality enhancements. Additionally, you’ll have more control over existing features such as animated transitions and can add as many audio tracks as you require or even record and include a voiceover on the spot. Because of the intuitive design of Movavi Slideshow Maker for Mac’s ‘Full feature mode’ interface, it will be easy to browse through the features that are available and find the tools that you require. Granted it is more involved than the ‘Easy mode’, but there are far more options available as well to customize your slideshow. All in all, it should be clear that you will be spoilt for choice when creating a slideshow with Movavi Slideshow Maker for Mac. Depending on whether you’re looking to create a slideshow quickly and easily or want more control and customization – you should pick the mode that you feel suits you best.